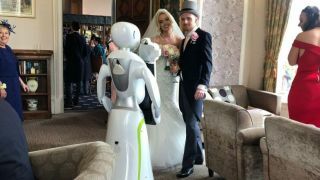 Would you hire a robot for your big day? The news that robots are coming for our jobs has been making the rounds for a few years now. And while automation is definitely taking over our lives, many of us have nothing to fear... unless you're a wedding photographer, maybe? "This was a fantastic addition to our day and our guests are still talking about it," Gary, the groom, told Bride Magazine. "Eva went down a treat and really got people involved. It made a nice change from the normal photo booths." When Eva is hired, Service Robots sets up a printing station at the venue, so images can be printed out instantly. If the guests prefer to not take a keepsake home, the images can be uploaded to a social media platform of the guest's choice, provided an internet connection is available at the venue. A spokesperson for Service Robots told Bride Magazine that, "People are less interested in traditional photo booths. They are looking for something new and memorable that will really make their event stand out. None of the guests at this wedding will ever forget their first encounter with a robot photographer and it will provide the happy couple with a lovely reminder of their special day." In any case, we don't see Eva giving flesh-and-blood professional photographers any competition... at least not yet. After all, she is essentially a fun version of a photo booth or selfie station, one that can easily upstage the couple on their very special day.